This chunkster (over 1000 pages) was fascinating from first word to last. • The ten-year-old boy watching the national political conventions on his family’s new (and first) television set. • The roller-coaster ride of the 1992 campaign. • The extraordinarily frank exchanges with Newt Gingrich and Bob Dole. • The delicate manipulation needed to convince Rabin and Arafat to shake hands for the camera while keeping Arafat from kissing Rabin. • The cost, both public and private, of the scandal that threatened the presidency. Great commentary Jennifer. I have heard really great things about this auto biography from others as well. I have read a fair amount of Presidental bioraphies. Though I have not read any autobiographies of US Preseidents this one looks like a good place to begin. I bought this at a book sale but it's still sitting on the shelves. I hope to get to it some day, especially since it's so long! I loved this book too, so much that I forced my Mum & sister to read it after I finished! My somewhat battered copy is now sitting on my shelf, waiting for the reread that is bound to happen at some point. 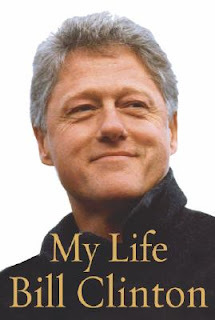 I also really enjoyed Hillary's autobiography. I tend to avoid biographies, autobiographies, and memoirs, but you have definitely made me reconsider. Besides, I do love Clinton. I wish he could be President again! I saw this yesterday on GR when I was looking through Obama's books (remembered the latter had been popular here but I'd never got to them). It looks a good book, though I'm surprised by the page count! That said he obviously had much to say and wanted to say it, so no doubt this is incredibly informative. Big ditto on this one! I read it a few years ago, and it took me a while to get through it, but it was worth the time.